It's been very hard to find Delta fountain pen ink so I was glad to discover that The Pen Company carries it. Fine product and excellent service. Fantastic colour really pleased with it. Flows nicely. Quick delivery. All round good job. Multi colours, ink cartridges have been a great idea and the varieties are good. Delivered quickly and very happy with the product. Cheers. Both the Delta and Diplomat cartridges are a standard short international size cartridge, and you should have no problem in using a Delta cartridge in a Diplomat pen and vice versa. 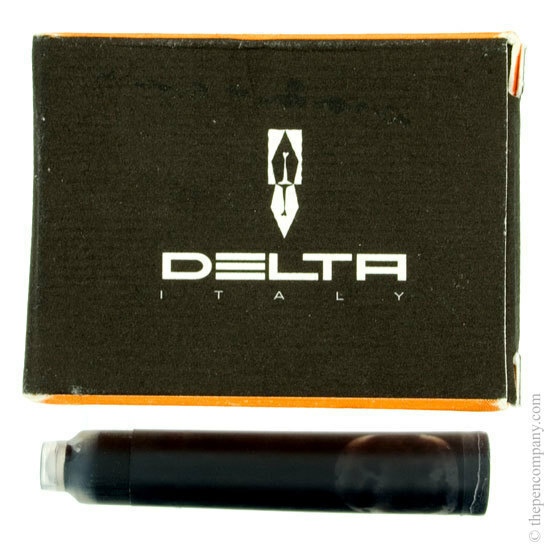 These pens accept 'standard international' size cartridges such as these Delta ones most of the brands we stock will fit this pen with the exception of Lamy and Sheaffer.